Craig Tapp and his team that will compete for the national title. MEADOW springs Golf Club will be represented in Australia’s biggest and most successful pro-amateur team’s event, the Holden Scramble, at the event’s Championship Final on the Sunshine Coast. 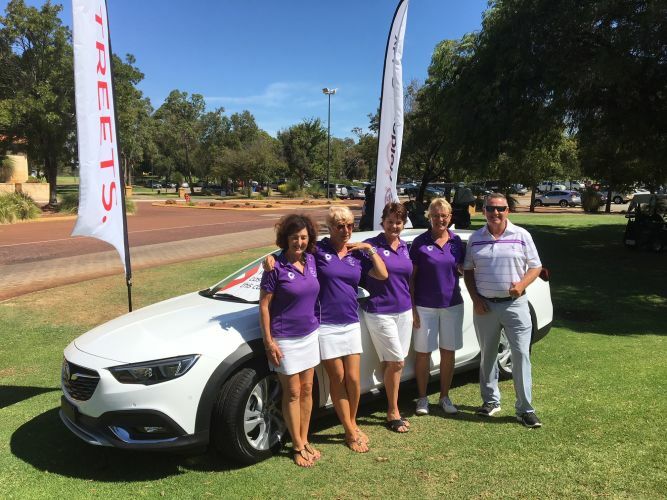 After qualifying at their local event earlier in the year, the team led by PGA professional Craig Tapp, Linda Donnelly, Tracey Joyce, Janice Williamson and Margaret Romaior held off a host of teams to grab the one spot available at the regional final, played at The Vines Resort and Country Club. The team will now compete for the national title at the Holden Scramble Championship Final at Twin Waters Golf Club from May 18-21. Craig Tapp said making the conscious effort to keep everything low key and focusing on having fun was the game plan from the start. “We saw how nervous everyone was around us so we tried to create a relaxed environment where we could have a laugh and get to know one another better,’’ he said. It will be Tapp’s third championship final. Teams will be treated to four days of golf played in full tournament conditions, three social functions and the chance to rub shoulders with greats of the game such as two time PGA Tour winner Craig Parry on the final day’s play. All teams have won just by getting to the final, having beaten about 600 teams at the local level and 60 teams in the regional final.